Oh. My. Gosh. It's here. At my house. It's real. Finally. Wow. My trip to Florida was filled with family time, the professor's colleagues, and travel to and fro. Therefore, all my photos are from Saturday and Sunday. I managed to snap photos for the blog in between large amounts of eating and socializing. Here's a trip to Florida if you're suffering from winter doldrums! In Sarasota, you can swim in a heated pool with a view of the real water beyond. Lots of people live in enormous high rises that are taller e ven than the palm trees. There are also lots of flowers in the winter time. We went to the local farmer's market, which was very crowded with people and well behaved dogs...and my brother-in-law loaded up on vegetables to cook later on. We found cold press Italian olive oil, specially imported from a family farm in Italy to the Sarasota Farmer's Market. We also found good tea, organic star fruit, and other edible delights. I find the book promotion stuff a bit awkward, but my father-in-law buoyed me along and apparently also acted as my advance team, since two out of the three places recognized us already! On Friday night, we went out for a very upscale meal. (I had duck cooked two ways. Fancy.) On Saturday, we ate brunch at my father-in-law's place, Lebanese food for lunch at a restaurant, and my brother-in-law cooked up a lot of those veggies for dinner. We ate well. We even stopped by a grocery store on Saturday night to grab a bottle of wine and caught this sunset from the parking lot. Imagine, a grocery store parking lot with an ocean view! On Sunday, we drove to Gainesville so the professor could give a lecture at the McGuire Center for Lepidoptera Research. On the way, we stopped at Hancock Groves, a citrus farm that has been owned by one family for 100 years. We loaded up on citrus for the professor's colleague and our host for the next couple of days. I hope you've enjoyed the Florida photos!? For me, the biggest excitement of designing is dreaming of a project. Sometimes when I can't go to sleep at night, I design things in my mind until I can quiet things down in my brain. However, for a long while now, all my designs have been secret, for books or magazines or sale. I cannot share the creation process and everything's on a deadline. While I still love knitting (and feel deprived when I can't squeeze it in), I've been dreaming lately of some knitting that is just for me. This morning, I planned my knitting projects for the trip. First is a project on a deadline, but I hope to finish that soon. Second is finishing the second of a pair of socks (for me!) that I've been carrying about, in between work projects, for ages. The back-up, back-up knitting? A pair of mittens. I'm combining a rose/burgundy alpaca yarn, a skein of Patons Stretch sock yarn (wool, cotton, and a bit of elastic in a variegated color, and a pink cashmere silk laceweight as a carry along (extra soft warmth). Then, it occurred to me I might run out of the alpaca yarn, but never fear!! I dived into the stash for one half-finished skein of dk weight olive colored wool. The professor happened to walk by as I did this searching. He was stunned. I thought it was because of how much stash I have (it does fair take the breath away...) but that in a full closet of yarn, I can remember that I possessed a half skein of olive colored dk weight wool that would match this project. Once I got my head out of the enormous tupperware bins in the closet, I was able to respond. "What can I say?" I replied. "I've got a good memory for color." See you soon! Keep me company here on my time off and leave a comment! Dicuss your stash diving experiences? Design dreams? You may remember back in March I was busy knitting up something sweet with polka dots. Now I can tell you what all that was about! 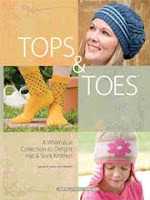 I contributed a fun sock design to Tops & Toes, a beautiful new spiral bound book with lots of fabulous sock and hat patterns. 3/1- Me! Please drop by my blog! There will be interviews by the editor, interviews by designers for other designers, and even an interview of the editor to find out how this book came together. I think it will be good fun. So, put a note on your calendar and plan for some enjoyable surfing when this starts in just a few days! Enjoy! The professor always brings home flowers on Valentine's Day...even if I've told him I don't need them! On a university campus, somebody is always using holidays to have a fundraising opportunity. In this case, it's the horticulture club and their advisor is a friend of ours, and they sell roses. I'd prefer Fair Trade flowers, but as that wasn't on offer, I was happy to take whatever my poor exhausted professor brought home. He's been in charge of shepherding some visitors to his department (5 visitors in 5 weeks) so it was just good that he didn't collapse, with flowers, on his walk home. That said, the professor's office is very overheated and the roses were sad and droopy just like he felt. I cut their stems, popped them in water with some "pep me up" sugar, and we got ready for our Friday night dinner guests. In walks our favorite Norwegian bachelor farmer, err, make that Norwegian bachelor biologist, for dinner. (For more on this NPR listener joke, check out this great essay.) Note: our friend is really from Norwegian stock, he's a longtime bachelor, and his PhD specialty? Botany. He's not a radio show character but a real person and we enjoy his company. Someone in the department received these flowers. She doesn't like roses, and apparently her boyfriend wasn't listening. He wasn't even able to order the flowers himself; his mother did it. Then, she attempted to leave the flowers in the office over the weekend and her office-mate told her they wouldn't last and she MUST take them home. Our friend, the frugal Norwegian bachelor biologist, caught her attempting to throw them into the dumpster. "Oh!!" he exclaimed. "I know someone who will enjoy those!!" We all suspect the boyfriend in this story isn't going to make it long term. That said, if you're at a university, this sort of dating drama is par for the course. No sense wasting the flowers, after all, it's not their fault! Meanwhile, Sally the dog has discovered a new love. The storms knocked hackberry limbs into our yard. With those limbs come berries (about the shade of that link) and Sally loves them. She is grazing on them constantly. We're worried that maybe they are not just old, but fermented...she's behaving strangely, but we love her anyhow. Any insights into hackberries? Let us know! Yet, in discussing the merits of true love...and not just on Valentine's Day, I think it's not really about the roses or even the hackberries. Yesterday night, the professor and I were making dinner--Asian salad rolls--and we ran out of a key ingredient...the rice skin wrappers. The professor walked up the street to our local ethnic grocery, and he came back with what we needed and a great surprise. The grocery has changed ownership, and they now have a much wider display of merchandise, including a lot of Middle Eastern food. In order to prove this new discovery was true, the professor bought me turnip pickles. We both like this treat; usually I have to make them myself. This just saved me hours of pickle making time, and that is a real sign of love these days...I've been so busy with work! Plus, it's dyed with beet juice, so it's pinkish red. Just right for Valentine's Day. You never can tell what will be the sweetest treat. Sometimes it's actually pretty sour and salty! Dear blog readers: Quirky Valentine's Stories? Stories of love gone awry? Drop a comment below and let us know why! Now, about that book... The short answer is: It's about fiber festivals in the United States. What are fiber festivals? (Each of the previous words links to a U.S. Fiber Festival. Have fun checking out their sites!) There are 26 designs and projects in the book as well. There's also quite a bit of useful information over to the right if you click on the Amazon link. Just scroll down and you'll see a few paragraphs that describe the contents of my book. Or, you can check out this promotional brochure, put together by my publisher to help sell the book to book stores. It's available Here. So, you may be wondering why I'm not posting loads of information on my blog. It's simple, really. I have this deal with my publisher...when I signed my contract, I agreed to let them publish the book--and not me! While I can mention what the book's about before it's out, it's not good form to do much more. Why? Well, publishing to the blog is still publishing...and I promised my publisher the chance to publish the book first! Fiber Gathering will be available for everyone to read in mid-March...and I can barely wait.... but I have to! And the last bit. I am extremely lucky to have a great deal of effort going into publicity for my new book. I do a little, and whew, it's hard work! My publisher is doing a lot more. This is wonderful, and I'm certainly not going to second guess their approach. Curious about how this book publishing thing works? You're welcome to ask me questions in the comments. I'll do my best to explain things. I'm no expert, but since I'm going through it, I might have a couple of insights. PS: Did you hear about the horrible plane crash near Buffalo, in Clarence Center? Well, the professor and I lived in Clarence, that sweet suburban/rural town, when we lived in upstate New York in 2002-2003. Our hearts go out to Clarence and to Buffalonians today. We used to live just 5 miles from where the accident happened...may they rest in peace. We had some wind yesterday. To be exact, 50 to 70 mile an hour winds. I was planning to go to Nashville with a friend; we'd scheduled appointments so we could carpool. We chose to stay home...it just didn't make sense to be on a highway for over an hour with such big winds. This morning, I looked out the window at my back fence and saw this. To get closer, I walked around these tree limbs that were wrenched off the trees by the wind. Apparently, our --very good-- dogs were still sleepy, because we don't think they noticed the big gap in their fence. Whew! What a relief that we didn't have to chase down loose dogs along with fixing the fence. They came right inside when we called them and didn't leave the yard. On Friday afternoon, I took a break to cook. You may remember the Bartlett pear invasion of October, 2008? Besides the endless jars of pear jams, and chutneys (which I admit, I'm still somewhat enthusiastic about), we also processed roughly 2 lbs of dried pears. I thought this dried fruit would be eaten quickly, as part of daily snacks. I ignored the dried fruit recipes that had accumulated. Now, in my winter effort to clean out freezer space (dried fruit processed without preservatives does best long term in the freezer), I came upon a colossal amount of dried pears. Our dinner table was filled with 5 fabulous guests who ate: beef/lamb shwarma spiced meatballs with onions served over brown rice, homemade hummus, avocado salad, tabbouleh, dilly beans, challah...and of course, that cake for dessert. Beverages included water, red wine (Merlot and Shiraz) and decaf coffee to wash down that cake. It was a great distraction from the work week. I've also been spinning. Infrequently, I admit, because I've been knitting a lot for work and lacking in any big chunks of time. However, this Sunday was the meeting of our local spinners' group. We saw two new groups of folks who were interested in learning more about spinning! Also, as usual, we shared lots about fiber arts and life. Two of our regular members (a couple) are still without electricity from the ice storm...2 weeks ago. Another mother and daughter combo said that the mom was without power for over a week...but her chickens kept laying, her woodstove warmed the house, and she made it through ok. Homesteading and camping skills are a good help in times of stormy weather! So, when stress overtakes you, do you make cake? Do you spin? Do you eat dinner with friends? (I'm taking any and all suggestions....) Sleeping? Sleeping is good. I'm trying that, too! It's always a surprise to find out that someone's been talking about me. :) My ears weren't burning. In fact, I'm often the last to know when my writing's been published or discussed...I sometimes get a copy of the publication when they pay me. It's sometimes a long wait. In this case, a friend emailed me and said, "Hey, I was at the grocery store skimming the knit magazines, have you read this? Even though I haven't lived in Virginia (the Washington, D.C. area) in nearly eleven years, it's still an area that I'll always be from. I was born in D.C. and grew up in Virginia...so even though "home" has been in Ithaca or Buffalo, New York, Durham, North Carolina, or now, Kentucky, another home is always waiting for me when I visit my family. This time, we went out for dimsum at a Chinese restaurant with my parents, sister-in-law, and two nephews. Noodles (the baby, as nicknamed by his older brother) just napped right through it. My three year old nephew Nate was in for a treat, as were the grown ups. It was the Chinese New Year, so we were entertained by drums, gongs, fire crackers and Lions. Then it was off to see the newly refurbished American History Museum. Since it's part of the Smithsonian, it's free...and it was very very crowded. I caught some photos of the mall while I was there. Right now, downtown DC is having a revitalization, but many areas of our nation's capitol remain shabby and in need of support. DC is in a strange position; Congress passes its budget, so although DC has only a non-voting representative, the Congress controls spending. In the past, it was always the non-touristy areas, like the school system problems (I taught in inner city DC right after college) or the horrible public housing. Now even the touristy sections need some help! Just about 11 days before, our national mall was filled to the brim with humanity on Inauguration Day. While I don't know how it looked just before Inauguration, I grew up visiting and playing on this stretch of green. I can say this...things were pretty well cleaned up...no trash remained. However, our national front lawn really looks shabby and literally downtrodden...no wonder after so many millions of Americans visited it. I'm wondering if those politicians who struck the mall refurbishment from the stimulus package have looked out their office windows lately? It was only after I moved away from the Washington area that I realized how close to the action I was when I lived here. I went to school with kids whose parents were in government,as my dad was, for a while. It was no big deal to see the diplomats' cars pull up to pick up kids from school, or to be held up in traffic for the presidential motorcade. One of my youth group friends happened to be the daughter of a congressman. One of my brothers carpooled to soccer with some kids who then moved to a bigger house. They had to change schools and soccer leagues, too! Their last name? Quayle. It's interesting to see how all this personal experience fits in the context of our bigger nation...in Kentucky, a week after a bad storm, we're in the national news...but it's a rare occurrence here. (yes, electricity, safe water, and heat are still a desperate problem for many. I am lucky.) I'd forgotten about how Washington, DC sometimes feels like the spotlight's been left on all the time. It's fun to go for a visit, I miss the news, the diversity, the culture... but I don't miss the business issues of the national focus (like a choice to cut funding for our National Mall--and our family planning!) and the glare of the lights.